At Vestal Park Rehabilitation and Nursing Center, our Recreation Therapy Department is designed to stimulate the body and mind through a broad range of activities intended to encourage social interaction and promote health and wellness. Every day is alive with a variety of social events and festivities. Under the leadership of an Recreation Director, our events calendar is full of meaningful and entertaining programs. The Recreation staff is augmented by a dedicated team of volunteers. 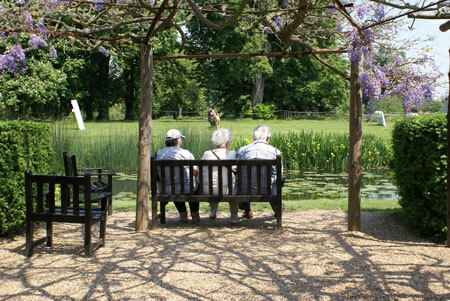 Residents often enjoy the companionship of children, teens, plants and pets. Local churches provide religious support via weekly services and individual visits. Residents look forward to seasonal events such as holiday concerts, semi-formal events, summer picnics, and our summertime barbeques. They can take advantage of the many activities offered during each season like cultivating and tending the raised vegetable garden, or other outdoor activities. Or, they can simply sit and enjoy our beautiful landscaped grounds while relaxing on our outdoor patio, either enjoying the warmth of the sunlight or sitting underneath a spacious awning. Vestal Park appreciates and values the opinions of our residents when it comes to their care and stay at our facility. The residents of the facility can choose to participate in the Resident Council. This council holds monthly business meetings. Through the Resident Council, residents can make recommendations for recreational programs, operational improvements and conduct fundraisers, etc.